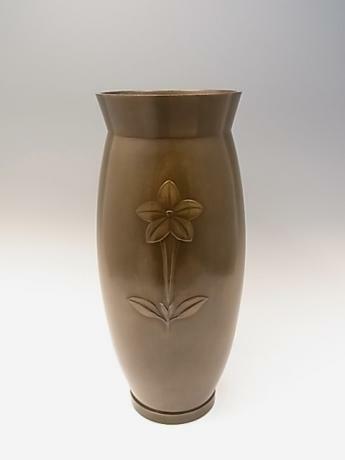 Japanese early 20th century (1935) floral design bronze vase by Japanese bronze artist HORI JOSHIN. HORI JOSHIN studied with famous Japanese artists, OSHIMA JOUN and KITAHARA SANGA (1895-1973). The vase measure 12 3/4" tall by 5 1/2" in diameter. 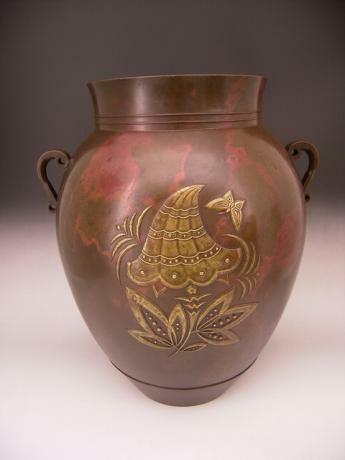 Comes with TOMOBAKO, or original artist signed w..
Japanese early to mid 20th century bronze vase by bronze artist KITAHARA SANGA (1895-1973). A student of bronze artist KATORI HOZUMA. He was also a NITTEN judge and an award winner at TEITEN 3 times. He lived and worked in the Tokyo area. 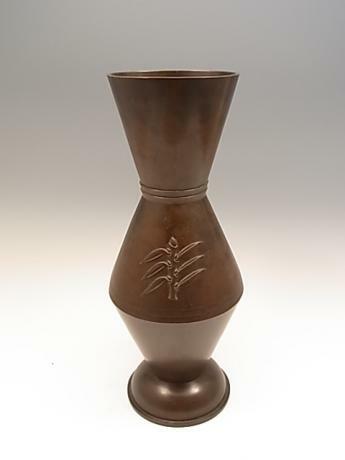 The vase comes with TOMOBAKO, or original artist signed..
Japanese 20th century large silver vase. 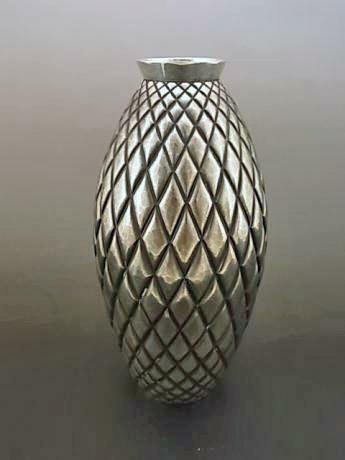 The vase is done in a traditional design with side handles and rings. 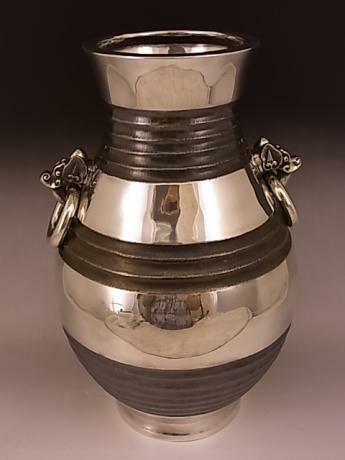 The silver vase is signed on the bottom and stamped JUNGIN, or pure silver. Comes with TOMOBAKO, or original artist signed wooden storage box. The vase was made for SHOBIDO, OSAKA. 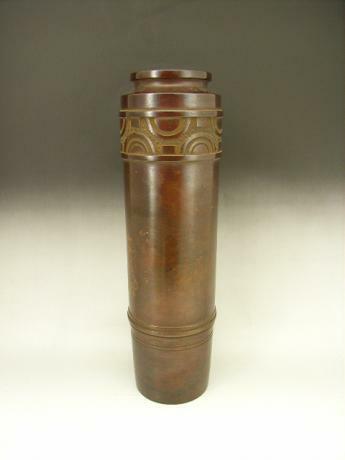 ..
Japanese early to mid 20th century bronze vase. Made by master bronze artist, NAKAJIMA YASUMI I. NAKAJIMA YASUMI I or TOYOJI was born 1877 to 1952. Comes with TOMOBAKO, or original artist signed wooden storage box. Stamped TOYOJI on bottom of vase and on TOMOBAKO. 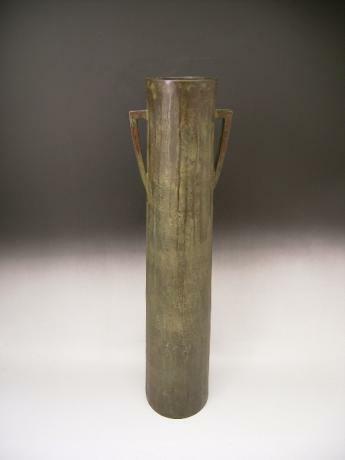 13" tall by 3 3/4" wide at its ..
Japanese early 20th century bronze vase by master bronze artist MURATA CHOSEN. 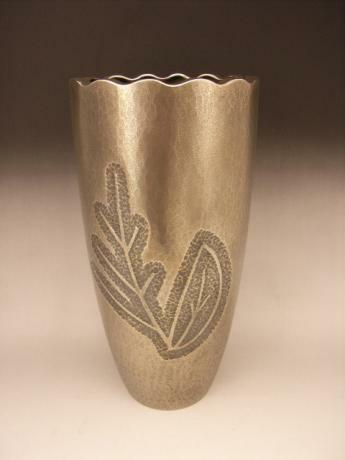 The vase has a beautiful lighter bronze inlay design on the front and back of the vase. Stamp of artist on bottom. 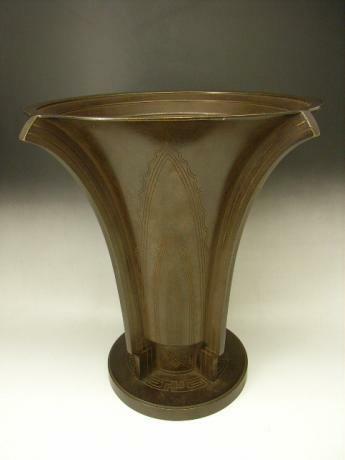 Vase comes with TOMOBAKO, original wooden artist signed storage box. 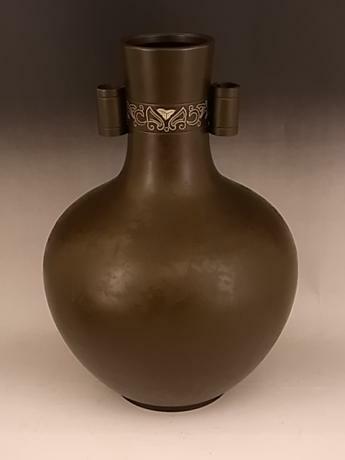 The vase is 14 1/2" tall and 12" in..